At this very moment, your body is under direct assault. At the cellular level, your biology is being attacked in such a manner that it is actually altering your very genetic coding. Your DNA is under consistent bombardment through not only the food you are eating, but by environmental factors that are literally ripping apart your DNA. 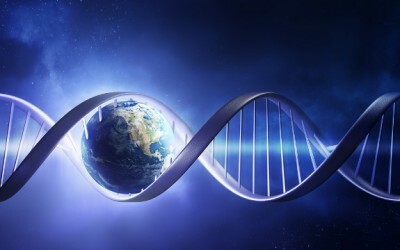 Fragmenting your genetic blueprint, the ‘fingerprint’ of your humanity. It’s all been admitted in peer-reviewed research that is continually ignored by the mainstream medical establishment. In fact, major government groups backed by financial corporate interests are actually streamlining the very biology-crushing technology that is to blame for an explosive rate of disease across the nation. Despite being linked to sterility, infant mortality, organ damage, depletion of micro-organisms within the biosphere (essential for the cultivation of food on our planet), mutant insects and ‘super’ weeds, the USDA has actually decided to fast-track biotechnology giant Monsanto’s approval process. Upwards of 90 plus percent of many different crops are already genetically modified and placed on your dinner plates — a number that is not satisfactory for Monsanto, who now seeks to dominate 100% of the entire agricultural industry with its genetic manipulation. Chemicals like BPA line the plastics used by millions worldwide, and despite being linked in hundreds of studies to cancer (particularly breast cancer), the FDA has repeatedly sided with the multi-billion dollar BPA industry, who will generate over 8 billion dollars by creating more than 4.7 million metric tons of death-linked BPA this year. This is a chemical that has peer-reviewed research has tied to diabetes, heart disease, cancer, behavioral disorders, and many other conditions. The healthcare juggernaut that is the mainstream medical establishment also continues to pump out pharmaceutical drugs that are now known to kill more people per year than traffic-related fatalities. In 2009, it was conservatively estimated that pharmaceutical drugs trumped traffic fatalities with around 37,485 deaths nationwide. The overall death toll regarding known pharmaceutical drug deaths and medical mistakes alone, only around 10% of which are believed to accurately be reported, comes in at 783,936 per year. On average, a pharmaceutical drug contains 70 side effects. Many contain around 525. These side effects may include death, or in the case of drugs like Prozac, suicidal thoughts and tendencies. Of course the link between Prozac and suicide was covered up for decades by the drug maker Eli Lilly & Co. In 2005 it was revealed by a Hardvard-based whistle blower who released the information to the public, proving to the world that Eli Lilly lied for over 15 years and covered up studies linking Prozac use to suicide. In his own words, he said the public was being treated like ‘guinea pigs’. The same events can be interchanged with virtually any drug company, many of which are now being forced to pay millions for false advertising and the resulting deaths that came from the use of their products. In the realm of chemotherapy, it is now being admitted that the procedure actually kills patients more quickly and destroys the body itself. I am not here to scare you into isolation. I am not here to sell you a solution in a bottle. This is what we are facing. It is up to YOU to sound the alarm and restore order to the medical paradigm. We now have the opportunity to either sit idly by and allow ourselves to succumb to the healthcare juggernaut that lives within the United States or take back our health. The information surrounding the healing power of natural herbs and whole food items is bountiful, with studies finding that turmeric and ginger alone shrink tumors by anywhere from 50-81% in a number of weeks. Alternative cancer treatment centers are being targeted by the United States government and natural healers are being imprisoned for selling organic herbs from their own farms. The time is now to reclaim our health freedom, and it requires YOUR involvement. Yes, we are under genetic, cellular, personal and Constitutional assault. In fact, that is why I coined the term "Genome Disruption Syndrome", http://www.GDS-Therapy.com. As the Medical Director of the Natural Solutions Foundation I applaud this video and agree with what is said in it. In fact, I would like to make contact with the you, Anthony, and invite you to appear on our weekly radio show, the Dr. Rima Truth Reports, http://www.HealthFreedomPortal.org, every Sunday from 10 AM to 12 noon Eastern Time. I disagree with some of the commentators in this thread, however, who feel that our freedoms are gone. Going, yes, but gone? Not yet unless we believe that there is nothing we can do. Our voices, creating an uproar four times in the past 3 years, have literally forced the FDA to back off on disastrous guidances and regulations which would have turned every natural substance into an unregulated drug and stopped compulsory Swine Flu inoculations dead in their tracks. That happened because huge numbers of people figured out the FDA's dirty little secret: they are weaker than we think and we are stronger than they can tolerate. If we all knew that, they would not be able to function. But "riding the freedom mouse" and taking action together pushes the globalists back – time after time. The issue is whether we can overcome our inertial and despondency to take action, which is, after all, taking responsibility! You say, and I quote "restore order to the medical paradigm". Not possible. We done did lost control several decades ago. If you haven't taken a peek at Death By Medicine, you all should read whatever you can find online. And if that's not scary enough for you, just waltz on over to youtube and type in Marketing of Madness and watch the full 3 hour video about the medicine of psychiatry today and how it is being used against us so subtly we didn't even notice, except those of us who like to ask the question "exactly what IS a mental problem"? What does it look like? What does it resemble? How do you test for it? There's lots more, too, but that should be enough to scare the pants off a few of you. Or, at least, maybe make people think about our paradigms in a different context. @ Jacque: The printed words are what's in the video, so you don't really miss much by not watching. But the big picture here, Tony, is that it doesn't matter a whit anymore which drugs or foods or environmental factors or whatever else you can think of that might impact our bodies. Once Obozocare hits us in 2014 we will have literally no say over ourselves anyhow. Bush started the ball rolling with the patriot act and obozo put the crowning touch on the thing with his signature scrawled across the NDAA paperwork. We have no personal rights of any kind left, and that includes our health and well-being probably more than anything else you'd care to mention. Only people don't see it for what it is just yet. The hand has been tipped, but sheeple are just in a daze over the election fraud so they literally aren't paying attention to matters at hand. But it won't matter much anyway because our hands are now tied. Freedoms, pretty much all of them, are behind us. How True Anthony the research on Turmeric is exploding and people are beating cancer by many natural ways. Now that there is no money in it "natural cures" the drug companies will ignore it and the uneducated will call it BS. Let’s pray California's GMO Labeling passes. Thanks for the video. You should do a weekly wrap up video of news of the week. Yo, the video is not loading.